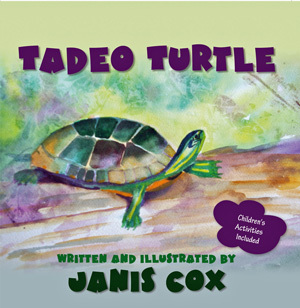 Creative Saturdays - Mixed Media Tadeo Turtle. Today I am going to add a linky at the bottom of this post. If you have art ideas for kids please link your post. Please only link kid friendly art ideas – no recipes (unless a specific recipe for children to make) or adult crafts. I will have to remove anything that does not follow this rule. This week we moved to our winter residence in Arizona. I found a few minutes to have fun – real fun. I found some scrapbooking papers that I had picked up at a garage sale and wondered what I could do with them. This is what turned out. Decide on your animals, fish or plants. Cut out from the papers. I decided on Tadeo and made three of them. Put your pieces together to make your figures. On the watercolour paper apply water using a brush or spray bottle. Drop colours onto the wet paper. Sprinkle salt. Decide on your pattern for the figures. I tried several placements before I was happy with the result. Now paste the figures onto the dried watercolour paper. Then paste over again all over the picture. This was fun. Wait until completely dry. I added more watercolour on top of the pasted paper. This turned out to be interesting as the colours were different and I saw shapes appear. I added the eyes and toes with black marker. Additional details could be added to the picture as well. Please link your kid friendly posts below. And please visit the person before you so we can make a community of friendly people here. This entry was posted in Creative Saturdays and tagged art, crafts, Crafts, glue, Janis Cox, kids' activities, mixed media, painting, scissors, Tadeo Turtle, turtles on October 26, 2013 by JanisCox. I love this post and your beautiful artwork! Thanks so much for linking up with us on the Hip Homeschool Hop! That is beautiful. Thank you for linking to the Virtual Fridge. Your post has been featured on this weeks Virtual Fridge.